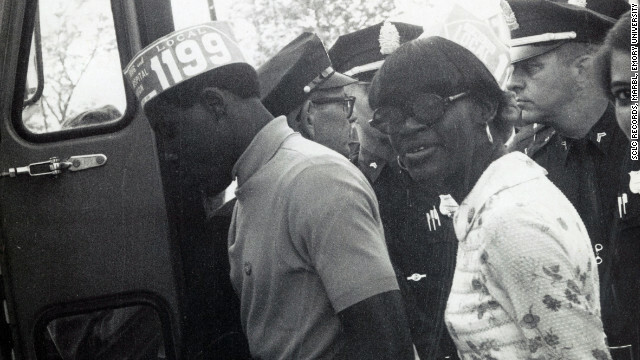 Police arrest protesters at a 1969 hospital workers strike in Charleston, South Carolina. (CNN) - If you look at online histories and timelines of the fabled Southern Christian Leadership Conference, there's not much information listed after the 1968 assassination of the Rev. Martin Luther King Jr.
Up until then, you'll find detailed accounts of civil rights actions. Afterward, you'll see the line of succession to the organization's presidency but not a lot in the way of how it carried on fulfilling its mission of social justice. That's why, perhaps, an exhibit that opens Friday at Atlanta's Emory University proves eye-opening. It features material from the 918 boxes of photographs, correspondence, memos, reports, fliers and videos that Emory University's Manuscript, Archives and Rare Book Library acquired, at an undisclosed price, from the SCLC archives. A 1979 march against injustice in Decatur, Alabama. 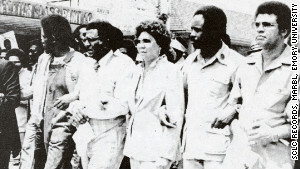 The archival materials primarily cover the SCLC's activities from 1968 to 2007. Among them are the Poor People's Campaign of 1968, the Charleston hospital workers strike in South Carolina in 1969, health care hearings for poor and black Americans in 1984 and a gun buyback program in the 1990s. "There is an assumption that after King, the SCLC lost relevancy," said Michael Ra-Shon Hall, a doctoral candidate in Emory’s Institute for the Liberal Arts and one of three curators of the show. "That's completely untrue," he said, pointing to how the gun buyback program was a precursor to the gun debate of today. Or look at Resurrection City, the tent city set up on the Mall in Washington in 1968 as part of the campaign to end poverty. That was a precursor to the Occupy movement, Hall said. "This is a story not a lot of people know," said Sarah Quigley, a manuscript archivist at Emory and another curator of the show. "The impression is that on April 5, 1968, the SCLC closed its doors forever." Founded in Atlanta in 1957 by King and other activists, the SCLC stood at the forefront of the struggle for equality in a Jim Crow South. King was the heart and soul and face of the struggle. That Civil Rights Movement (in capital letters) may have ended in 1968, Quigly said, but the struggle for human rights didn't. The Emory exhibit also includes the SCLC's efforts to end apartheid in South Africa and features photographs of activists boycotting Winn Dixie grocery stores in Atlanta and other cities because the supermarket sold products made in apartheid South Africa. There's also a poster of an amateur talent showcase for young people that promoted a nonviolent lifestyle called "Rappin for our Future" and a 1982 poster for a march on Washington. Curators hope that the exhibit will help reveal how a preeminent civil rights organization continued its mission into a different era. “One of the things I like is that it’s a very visual exhibition – visuals have played a consistent role in the struggle for equality,” said Emory professor Carol Anderson, another curator. “You see the marches, you see the poverty in Resurrection City, you see the meetings with key leaders as they’re trying to create a much more peaceful world." The exhibit opens Thursday at Emory University's Robert W. Woodruff Library.